End of the Jôkyô era: disciple of Sadoshima Denpachi, he received the name of Sadoshima Saburôzaemon and performed in Kyôto as a tachiyaku. Fall 1695: Saburôzaemon went to Edo with Mizuki Tatsunosuke I. 11th lunar month of 1695: Saburôzaemon performed at the Ichimuraza in the kaomise drama "Shiki Gosho Zakura". Second half of the 1690s (? ): he went back to Kamigata, where he performed as an oyajigata. 1st lunar month of 1708: Saburôzaemon became sakusha and worked in Kyôto at Kameya Kumenojô's theater on the new year ni-no-kawari drama "Keisei Akatsuki no Kane", which was produced by Sakakiyama Koshirô I. 11th lunar month of 1714: Saburôzaemon worked in Kyôto at Miyako Mandayû's theater on the kaomise drama "Yorozuyo Saiwai Gura", which was produced by Ogino Chôdayû II. 11th lunar month of 1716: Saburôzaemon worked with Sakakiyama Kansuke I in Kyôto at Miyako Mandayû's theater on the kaomise drama "Eboshidakara Mangoku no Kaname", which was produced by Sakakiyama Shirotarô I. 11th lunar month of 1717: Saburôzaemon worked in Kyôto on the kaomise drama "Iwao no Matsu Manbai no Midori", which was produced by Miyako Mandayû in his theater. 11th lunar month of 1718: Saburôzaemon worked in Kyôto at Miyako Mandayû's theater on the kaomise drama "Meoto Matsu Jufuku no Kodane", which starred Mihogi Gizaemon I, Bandô Hikosaburô I, Kaneko Kichizaemon, Yamashita Kamenojô I, Miyazaki Giheita, Yamamoto Kamon, Tamagawa Genzaburô, Hyakuninshu Genzaburô and Otowa Jirosaburô I. 11th lunar month of 1719: Saburôzaemon worked in Kyôto at Miyako Mandayû's theater on the kaomise drama "Shôjô Zakaya Mannen-gura". 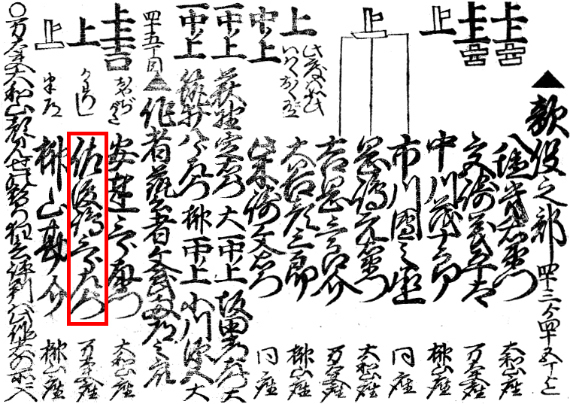 Summer 1722: Saburôzaemon worked in Kyôto at Miyako Mandayû's theater on the drama "Ono no Takamura Senbon Ôgi", which was produced by Sawamura Chôjûrô I. 11th lunar month of 1725: Saburôzaemon worked in Kyôto at Hayagumo Chôdayû's theater on the kaomise drama "Ôkamado Hatsumen Bako", which was produced by Sanogawa Mangiku. 12th lunar month of 1725: Saburôzaemon worked in the same theater on the kiri kyôgen drama "Kashû Ishikawa-zome". 1st lunar month of 1731: Saburôzaemon worked in Ôsaka at the Kado no Shibai on the ni-no-kawari drama "Futatsu Mon Katana no Meigetsu", which was produced by Sadoshima Chôgorô I. 11th lunar month of 1735: Saburôzaemon worked in Ôsaka at the Kado no Shibai on the kaomise drama "Ôyamato Kane no Kinzan", which was produced by Nakayama Shinkurô I. No record afterwards. Sadoshima Saburôzaemon started his career as an actor and ended it as a sakusha. He was active as a sakusha from the second half of the 1700s to the middle of the 1730s. He worked on at least 30 dramas.